Prominent & Leading Manufacturer from New Delhi, we offer jog conveyor dryers. Drying up the coated seed surface. Jog Conveyor Dryers are mainly used after the coating, pelleting and weight gaining process to prevent wet kernels from clumping together during bagging off. They round up Cimbria’s big machine range for Chemical treatment of seeds including especially the Centricoaters and Chemical mixing systems. Thus, Cimbria is able to supply complete treatment- solutions from A to Z, exactly tailor made for our customer’s individual needs. Due to very gentle handling of the sensible product inside the machine, there is no danger of abrasion on the coating layer. Wet product coming from the coating machine, is fed to the inlet bin of the JCD. 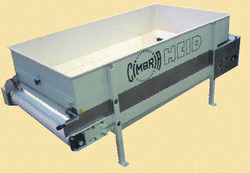 The product passes the feed regulation slide and enters the drying section, where warm air is blown through the product layer from underneath. Moist air is aspirated from top and led to a de-dusting plant. The amount of aspirated air is app. 10% higher than the warm air amount, thus creating an under pressure inside the machine, preventing any exit of dust. The airflow through the product on the drying grid creates a fluidized bed, making the drying process very uniform and reliable. By means of the frequency controlled eccentric drive, product is conveyed towards the finished product outlet. There is an additional possibility to install a screening section with two screen layers at the end of the machine, to screen out over- and undersized material. This screening section is mainly used when running pelleted or encrusted seed, as well as weight gained kernels, mainly to remove clumps of kernels and grit. Warm air is supplied to the dryer by fans with adequate pressure. All conventional heat sources (Gas, Oil, Steam, Solid fuel) are suitable for the JCD operation. Depending on customer requirements and availability of heat sources, Cimbria is able to engineer a tailor made solution. Special attention should also be paid to expensive heat processing. The usage of energy saving and recovery systems is also extremely important to our valued costumer. To protect the germination capacity of the sensible seed, warm air temperature is limited to max. 45°C. Temperature sensors in the warm air supply guaranty the compliance of the adjustable temperature limit. In case of exceeding this limit, the integrated process control unit will shut down or decrease the heating equipment. Looking for Jog Conveyor Dryer ?